The H-Series™ 250 poster system has 250-square-feet of copy area that features beautiful versatility. Designed to allow you the maximum advertising surface in compliance with restricted city and county ordinances, you can break into new markets with the clean, contemporary appearance of durable stainless steel trim. Strength is available through the 16 1/8" roll-formed Galvanized/Bonderized panels with flanges that interlock panels to create a truly smooth posting surface. A minimal trim surface means your message speaks for itself. Our two-inch wide, six-inch radius stainless steel trim allows easy access to work quickly with either vinyl inserts or paper posting. Along the inside of the trim, gripper bars are quickly installed and tensioned through the use of a simple bracket system. In just minutes, your vinyl face can be up and ready to go. Easily service your advertisement from the front without risking your safety. The H-250 is a STRONG Panel, backed by STRONG Solutions. Easily hang, adjust and tension vinyl applications. Provides long life and easy access to vinyl tensioning brackets from front. Clean, unique look that draws attention to the message. Designed for maximum strength and minimum assembly, increasing productivity. Thick coating provides protection against corrosion and rust, ensuring a long life. Prevents ladder movement outside safe zone. Provides extra protection and resists corrosion. Break into new markets with the clean appearance. 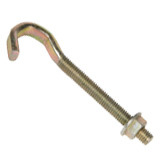 Located on side and bottom of face, user friendly Hook Bolt and Nut are used to tension gripper bar securely against the mounting bracket for vinyl inserts. Hidden under trim but easily accessible, provides cradle location for easy installation and removal of gripper bars on vinyl inserts. 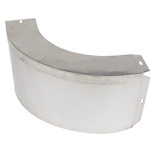 Part of the unique Stainless Steel Trim, the featured 6" radius formed corners have off-set connecting tabs for precision allignment and easy installation. 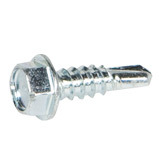 TEK Screws continue the sleek look provided by Stainless Steel while making installation of the trim a breeze. Galvanealed Sections rollformed to specific tolerences. 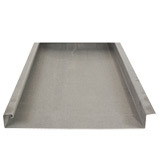 Flanges provide easy to install interlocking panels for a solid face. The galvanealed coating provides the versatility for vinyl paper posting applications.